Custom stainless steel repousse apron sinks from Handcrafted Metal add impeccable quality and class to any kitchen, in addition to an unmatched personal touch for your sink. Every feature can be customized, including the number, shape, and size of the bowls, and rims for undermount, drop-in mount, and flush mounting. We can even build your custom stainless sink with specially radiused corners to exactly match your existing sink cutout in granite! Each sink is made from high-quality 14 gauge stainless steel, which is 25% thicker than 16 gauge, and features coved corners inside for easy cleaning. Click on any sink below to see more pictures, and customize it according to your specifications! This sink showcases the best of stainless,copper and repousse craftsmanship. The Matte finish on the stainless sink and apron frame complements the smooth, antiqued surfaces of the S and scrolls. The planished background of the copper panel provides an organic, almost leather-like texture. The bowl is made from 14 gauge stainless. This fabulous sink combines all the best qualities of stainless with a repousse design in matte pewter. The repousse panel is hand-made and planished, then it is hand waxed to highlight the high points. The sink bowl is made from 16 gauge stainless and has our Micrograin finish. 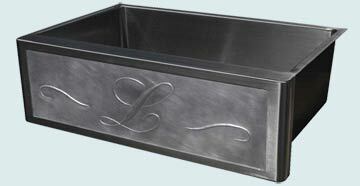 This stainless sink features a repousse design on a matte pewter apron insert. The panel has Fleur-de-Lis and double scrolls which add a decidedly French flavor. The sink itself is made from 14 gauge stainless and has our Micrograin finish. Our outdoor scene lends a strong rustic quality to this sink. The forest scene is set it into heavy borders to provide a substantial, massive quality to the apron. The sink itself is 16 gauge stainless and has our Micrograin finish. Offset letters give this apron a monogram flavor. 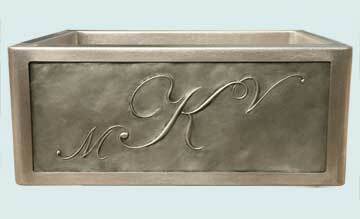 The smooth stainless frame places a distinct border around the zinc repousse panel. Its Matte finish keeps the stainless from shining.